We spent only one day in Delhi before leaving for Meerut. We decided to pick up a few things for our supper and eat in our hotel room, rather than going out. 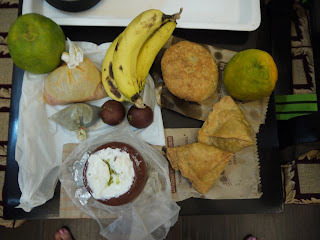 There is a nice sweet shop not far from the hotel and we got 2 fresh samosas (triangular fried pastry dough stuffed with potato and pea curry), an onion kachori (also fried dough but stuffed with onions; dal is more common), and a special lassi (sweet yogurt drink) topped with thick cream. We also got two loose-skinned oranges (yes, they are ripe even though they are green) and a few bananas. The little bag is a chutney for the samosas. I have to say I had one samosa and a few spoonfuls of the lassi below the cream, plus the fruit. It was enough! Our trains probably passed each other! We took the Shatabdi from Dehra Dun to Delhi last night and are leaving for the airport to fly home in an hour. Have a great time - we sure have. Yum! Last night we hosted a dinner for a bunch of old-time musicians, and I made a curry I had never cooked before. If my memory serves correctly, it was Shahi Murgh Badaani or something. Very simple ingredients. Bhoona lots of onions, whole cardamom, and coriander seeds. Mix in some water and blend it thoroughly. Return to the pan, add the chicken (seared previously) and some yogurt, simmer for an hour or more. I felt it was a bit heavy on the cardamom, but it got rave reviews from the guests!